Should You Water Your Trees During The Dry Summer Months? | Mr. Tree, Inc.
Should You Water Your Trees During The Dry Summer Months? Summer is here, and with it are long days, heat, and dry weather. For people, that means putting in extra effort to stay cool, as well as drinking plenty of water to stay hydrated. But what does it mean for the trees on your property? 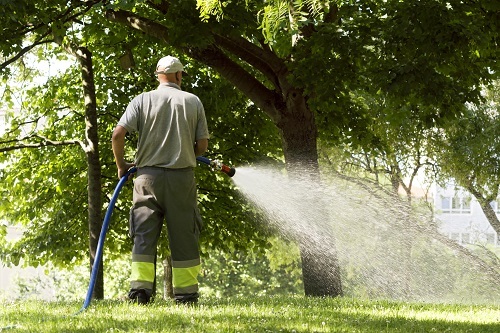 Surely, the dry summer season means that you’ll need to water all of your trees regularly? Of course, as with any question pertaining to trees, the actual answer is a bit more nuanced. The fact is, the type of care that trees require varies greatly from species to species. We’ll look at some of the specifics here. It goes without saying that all trees need water. However, exactly how much water a tree requires depends on a wide variety of factors, including the climate, the species of tree, and the conditions of the area where the tree grows. Some trees, such as palm trees, thrive in moist soil and will need to be watered regularly to survive in arid climates. Other trees, such as the hedge maple, prefer a drier soil and don’t need to be watered very much. Certain trees, including many Oregon native plants, won’t need to be watered at all, as they are adept to survive in the local climate, including during the harsh summer months. Age is one of the most important factors when it comes to the watering needs of trees. If you have an older tree in your yard, chances are it won’t need much water from you. The reason for this is that older trees have had plenty of time to develop an expansive root system underneath the soil; these deep roots will be able to reach groundwater in all directions and keep the tree hydrated, even during the hottest months of the year. On the other hand, saplings and younger trees will not have had time to establish their root systems yet. As a result, they’ll have a much harder time accessing underground water and may require a great deal of help from you for the first few years of their lives. As you might suspect, Oregon native trees will survive better without regular watering. If you are attempting to grow a non-native species of tree, on the other hand, it will often require a bit more water. After all, the Oregon native plants are specially adapted to the local climates and have done just fine for millennia without human intervention. Native trees are often especially drought-resistant, having soaked up most of the water they need during the rainy winter months. One great example is the Douglas Fir, Oregon’s state tree. Plant a few of those on your property and watch them thrive throughout the year, even under the harsh summer sun. But also keep in mind that you may need to water young Douglas Fir trees during their first season if it’s been a dry year. When you have trees on your property, you’ll want to quickly determine their needs. Do this by researching the species of trees that are growing on your property. Each type of tree is a little different, especially once you factor in the type of soil your property has, the age of the tree, and the weather in any given year. If it’s a dry year, your tree will need to be irrigated more than if it’s been very rainy. You’ll also need to factor in the health of the tree; if your tree has any damage to its roots, for example, it will require more water until its health improves. Needless to say, you’ll also want to conserve water whenever you can. One method for keeping your trees hydrated while preventing over watering is to use mulch. Place a 2-3 inch layer of organic mulch near the base of your tree to encourage the growth of beneficial microbes, halt evaporation, and prevent runoff. If you have newly planted trees, remember that all of their roots will still be in a small ball just underneath the soil. Often, it will take one or two years for those roots to become established. In that time, you’ll need to check the soil moisture regularly and, as it dries, wet the area around the tree. Be careful not to soak it completely; leaving a sapling waterlogged could be very dangerous for your tree. If you need to water a mature tree, you’ll want to water in a circle up to two feet around to allow the water to soak in deep and reach the roots; they will have spread far away from the trunk. Do not water right up to the trunk of your tree; this can cause rot, damaging or killing your tree. As soon as you notice runoff occurring, turn off the water off. Don’t let the soil become too saturated. If this occurs, you may accidentally suffocate the roots of the tree. Your tree requires both water and air to survive. As always, it’s important to continue your research and always be on the lookout for further information. One thing we recommend is contacting your local tree service. In the Oregon area, we can send specialists to your property to tell you exactly what your tree needs. We’ll help with anything including the planting of new trees and the care of Oregon native plants. Our arborists can also evaluate the health of your trees and provide specific recommendations to continue to help them thrive.